Chapman University’s School of Pharmacy (CUSP) will host its inaugural White Coat Ceremony on Friday, August 28, in Irvine, CA. In addition to welcoming the school’s first 77 students into the profession through the traditional white coating ceremony designed to mark the beginning of their professional pharmacy education; this first school of pharmacy in Orange County will commemorate the occasion by presenting The Gavin S. Herbert Award for Excellence in Pharmaceutical Sciences. 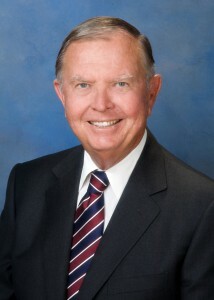 The initial recipient of this annual award will be presented to its namesake—Gavin S. Herbert, Founder and Chairman Emeritus, Allergan Pharmaceuticals. “Gavin Herbert is a hero of mine—what he did as a leader in building Allergan into one of the great pharmaceutical companies of the world is the stuff of miracles,” said Jim Doti, president of Chapman University. The award will come commensurate with a bronze bust of Herbert to be unveiled in 2016 that will reside on CUSP’s Harry and Diane Rinker Health Science Campus in Irvine, CA. While closed to the public, media are welcome to attend the White Coat Ceremony and Celebration for CUSP’s Doctor of Pharmacy (Pharm.D.) Program, Class of 2018. The event will take place Friday, August 28, at 4 p.m., at the Courtyard Marriott in Irvine, CA. A reception will immediately follow. (CUSP) is the first such school in Orange County. CUSP has received precandidate accreditation for its accelerated Doctor of Pharmacy program from the Accreditation Council for Pharmacy Education (ACPE)—a national agency for the accreditation of professional degree pharmacy programs. CUSP currently offers three programs: an M.S. in Pharmaceutical Sciences program accredited by the Western Association of Schools and Colleges (WASC), a three-year accelerated Doctor of Pharmacy (PharmD) program, and a 2+3 Freshman Early Assurance pre-pharmacy program. This year, CUSP will apply for WASC approval of a Doctor of Philosophy (Ph.D.) Program in the Pharmaceutical Sciences to open in the next several years. CUSP programs have been built on a strong foundation emphasizing assessment of the competencies, skills, knowledge and attitudes successful graduates should possess including communication, compassion, leadership and developing oneself to be a high performing team member.